Bugsee is a bug reporting tool that synchronized video, network and logs for Mobile Apps and Web, reports include video of user actions, network traffic, console logs and many other important traces from user's app. "So helpful in reporting bugs and requests!" Bugsee is wonderful for demonstrating bugs and for understanding bugs our testers report. If a picture is worth 1,000 words a bugsee is worth 10x. I wish you could set it to record more than 1 min of video in certain cases. Its not always clear to me why a video is the length it ends up being. I also think it would be amazing if there was an integration with Jira to make a ticket based on the bugsee (although this may exist and I don't know about it yet). Its amazing for bridging the gap between the words people use to describe a problem and what is actually happening. Very often, especially when getting tester feedback from non-internal sources, its very unclear what people intend to report based on their language. With the videos in Busgee I can look at what they are doing and usually the issues becomes much more clear. "You'll find out things you never would have and you will save time and money in support"
1. Bugsee provides up to 60 seconds of video leading up to the crash. This reveals things I could have only hoped to discover iff I happened to be there watching the user as they crashes the app. My favorite was when I watched a Bugsee video for a crash and discovered the user had 6 simultaneous touches on the screen, one of them being the back button. Honestly, there is nothing I dislike about this product. The issues I had they quickly iterated on and they are now features. You won't get better meaningful responsiveness than I've seen from the Bugsee staff. Buy it. If there is anything you don't think it has, just ask. They either have it or will be implementing it soon. 1. Amazing remote troubleshooting of crashes and bug reports of an iOS app that is deployed with a Verifone point of sale sled and a Zebra printer. Our deployments are all across the continental United States. 2. Faster QA cycles, since I no longer have to ask our QA engineers what they did to cause a crash or a bug. I can watch the video and I can see all the conditions of the crash or bug. What Mobile App Debugging solution do you use? The feedback loop is so easily closed and the accuracy is very high. We like to be able to pinpoint exactly where the issues are using the screenshot feature. Practically nothing. Their bug logging design just recently changed too - for the better! It helped our company greatly improve accuracy and we love using it. I wish I could see more knowledge on what screen a crash happened as not only a developer too. Implement asap and see your productivity soar! We build apps of different intensity levels and for different kind of customers - it has been great to use a product that allows the QA team to so-easily communicate with design and dev. "The best way to fix bugs in your apps"
Bugsee is an awesome product, that every member of our team liked so much. It saves us a huge amount of time for recording and reproducing any issues, extra communication routine. Now a recording of any issue and posting it to our tracking system take only 2 seconds, it is done directly from the application. Great integrations level! Now we have even more time to create great mobile apps! Bugsee made us and our clients happier! nothing) we just love this product. it is easy to use service. "Amazing tool for finding and fixing bugs"
The video recording of bugs is just an amazing feature. I do not know any other bug reporting product that has this feature. The installation was easy and fast. The user interface is very convenient and beautifully designed. I can not find anything that I do not like in the product. 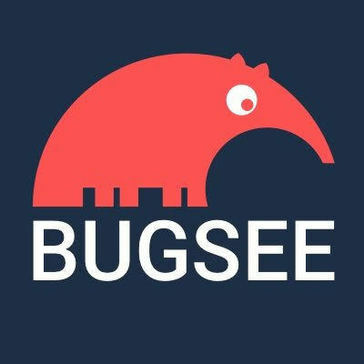 I would definitely recommend to consider using Bugsee, it is a great tool that will help your development team to find and fix bugs very quickly and efficiently. Effective bug tracking and faster bug fixing. "Easy to submit a bug as a non-technical user"
It records your darn screen! That makes it so much easier than try to explain what is going wrong as a non-technical internal product user. Bugsee automatically subscribes non-technical users to error reporting, which isn't really helpful to me. It would be nice to be able to specify whether you can actually do something about the error reports. It's super convenient. Try it out! The sales/account management team uses an internal tool called Boa to construct all of the user-facing experience, and it can be very difficult for us to debug. With Bugsee, I don't have to get into long convoluted chains with our engineers and can simply SHOW what is going wrong. The video recording is the best feature, our team loves the fact that this 60 seconds video tells you exactly what happened. iOS integration, design is awesome, reporting is fast and accurate and customer support is great. Everything is great. The only think I can think about is may be pricing, but for the value it brings we are ready to pay. "Easiest, most accurate bug reporting tool on the market"
The simplicity if integration into iOS is fantastic. We are using Bugsee on iOS, Android and Web. Bugsee won our team of developers across all platforms. Nothing. I wanted to say the current level of integration with Jira, but realized that it took their team 48 hours to resolve an integration challenge we were having with the platform. The main pain point we were trying to solve is a details bug reporting on mobile platforms. It was a very tedious job for our QA team to take a screen shot, describe it, attach to Jira. All of that produced a lot of steps that we avoid with Bugsee. Bugsee allowed us to report open issues a lot faster, which it turn enable us to fix them faster thus providing a better product and satisfy our customers. "our favorite crush reporting tool"
Everything is fine. Hope they will have mobile app soon. try free trial of ask support if you have any questions, they are great! "Video of bugs feature is amazing - really helps us make apps better"
Every detail is great. It's easy to install and to use. Support is really fast and helpful. Install it for all your iOS and Android app and you will love it. To know exactly when a crash happened and replay the user steps that lead to it. The pricing plan as we had lots of users and cost raised. Try it, it will not only help to solve crashes, but you will customers better. Crashes, specially the ones with Augmented Reality. It's often so difficult to replicate issues that our customers encounter. With Bugsee, we can see exactly what they are doing. It's expensive! It's also too easy to accidentally deploy to large groups. We are trying to identify user problems / bugs. "Best crash reporting tool I have ever seen." I would say everything, clean UI, accurate crash reporting, feature to merge similar crashes in one single issue. Apart from these all, the feature that shows video of the crash is really very helpful to identify the bug. Nothing. There is nothing I could find that is not good, and if there is anything that is not working properly, then Alex is really quick in fixing that to make it best again. We are using bugsee for a number of apps currently on app store, and bugsee has proved very helpful in identifying bugs in it, if any. "Best bug testing tool of the year"
We just love use Bugsee in our development process. Try iOS sdk it working great! "Awesome, nice, easiest bug reporting tool on earth"
Everything. The awesome design/UI, the fast reporting, the suppport, ... It so amazing. Uhm... Nothing. It so nice. I can't find anything i dislike. Only that CPU is running higher. The main pain point we were trying to solve is a details bug reporting on mobile platforms. Without Bugsee it took long to fix now not. Bugsee allowed us to report open issues a lot faster, which it turn enable us to fix them faster thus providing a better product and satisfy our customers. "Very nice bug reporting tool"
Integrated solution for reporting crashes, bugs. Automatically captures video to see what was going on in application before crash/bug happened. Permanent CPU usage for 20-30%, not really suitable for mobile device. When somebody is reviewing/testing your application, it is always an issue to see what really caused a bug/crash. Bugsee allows to capture video stream of what user had been doing, to not rely on his regular issue description like 'i was doing nothing, and it crashed', and provides full stack trace for crashes. "Bugsee - finally track down the issue"
Bugsee is a very easy to use platform that allows us to actually see what's going wrong when there's a problem. The video capture is critical for app QA. The tool is great - looking forward to an Android version. We've sped up our app QA cycles significantly. "Bugsee makes debugging issues fun"
After starting to use bugsee it´s fun debugging issues in our mobile apps, the user experience is amazing, and it helps you to find the root cause of any issues. It seems like a very mature, even with excelent support for the upcoming GDPR. I have not found anything yet to dislike, if we just could get the same for web apps, wihtout installing plugins. * We monitor all Bugsee reviews to prevent fraudulent reviews and keep review quality high. We do not post reviews by company employees or direct competitors. Validated reviews require the user to submit a screenshot of the product containing their user ID, in order to verify a user is an actual user of the product. Hi there! Are you looking to implement a solution like Bugsee?